Ripe and spicy, featuring cherry, plum, almond and earth flavors. As this plays out on the finish, leather and tobacco notes join the party and the wellintegrated structure provides ample support. Flavors of strawberry and black cherry mingle with notes of grilled herbs and black spices in this soft, rounded red, a wine with wide appeal. Based in an authentic sense of territory, the 2013 Chianti Classico Riserva Villa Antinori is 90% Sangiovese and 10% Merlot - although Renzo Cotarella tells me that the goal is to soon make this wine 100% Sangiovese. The bouquet is generous and nicely concentrated with dark fruit nuances and succulent spice at the back. Delicate floral nuances of wild rose and violets are given ample room for expression. The mouthfeel is velvety and fine in texture. You&apos;ll find alluring aromas of fragrant blue flower, wild berry, menthol, dried herb and a whiff of exotic spice on this radiant red. The juicy palate shows surprising richness for the vintage, doling out ripe black cherry, crushed raspberry, vanilla and cinnamon alongside polished, fine-grained tannins that leave a firm finish. A typical Chianti Classico with pretty leather and citrus character and hints of cherry. Medium body, light tannins and a crisp finish. Drink now. Complexité, structure et déjà un caractère extrêmement fruité! Marchese Antinori Chianti Classico Riserva n’est produit que lors des meilleurs millésimes et issu exclusivement des meilleurs raisins. Un vin qui ne manque pas de caractère! Elu dans le Wine Spectator Top 100 2018 ! Elu dans le Wine Spectator Top 100 2015 ! Une approche œnologique plutôt que viticole, une identité unique! Le Vignoble Pian delle Vigne est situé à 6 km au sud de Montacino et tire son nom d’une station historique qui remonte au XIXème siècle. Un vin à la personnalité hors norme! Matarocchio est l’une des plus belles expressions du Cabernet Franc en Italie ! 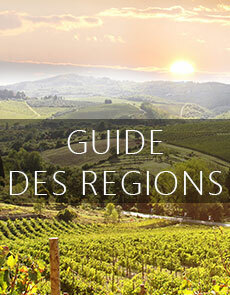 Solaia est l’un des grands Super Toscans de la famille Antinori, une magnifique vision toscane des cépages bordelais. Le Nipozzano Riserva Chianti Rufina DOCG est l'un des vins historiques produits au domaine di Nipozzano. Il conserve toujours un lien étroit avec le terroir de cette propriété.